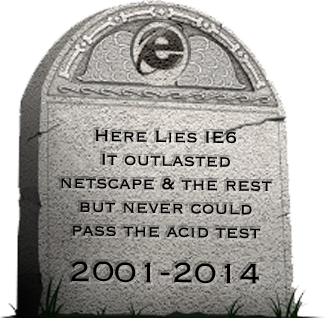 IE6 Death is a countdown to the death of Internet Explorer. Microsoft is planning on supporting IE6 until April 8, 2014. We need to stop the use of IE6 and promote modern browser technologies. Help stop IE6 and upgrade! We have been counting down for 4 years. Developed by @ryanparr and @skylark64, in partnership with @postano (we work there! ).